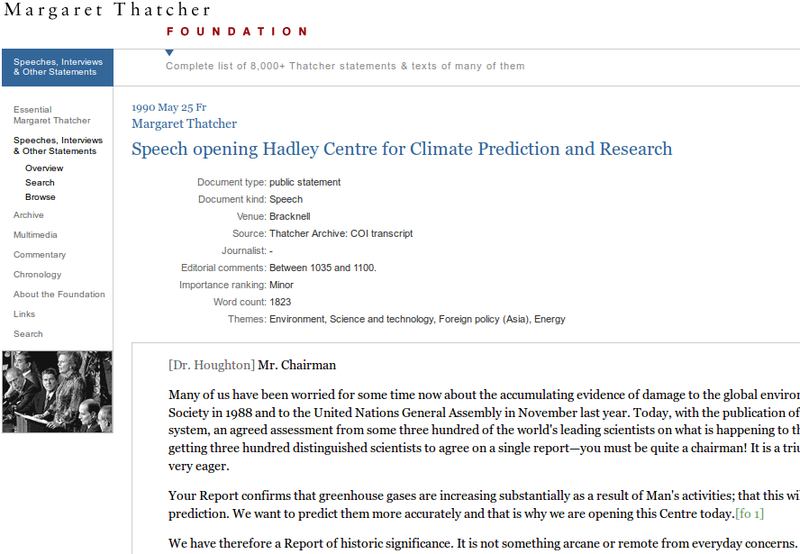 “Many of us have been worried for some time now about the accumulating evidence of damage to the global environment and the consequences for life on Earth and for future generations. I spoke about this to the Royal Society in 1988 and to the United Nations General Assembly in November last year. Today, with the publication of the Report of the Inter-Governmental Panel on Climate Change, we have an authoritative early warning system, an agreed assessment from some three hundred of the world’s leading scientists on what is happening to the world’s climate—all this under your distinguished chairmanship, Dr. Houghton. I congratulate you on getting three hundred distinguished scientists to agree on a single report—you must be quite a chairman! It is a triumph for you today, both the Report and the opening of the new Centre for which you have obviously been very eager.